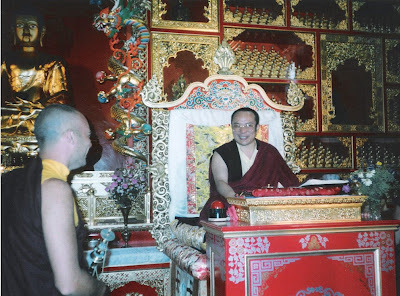 "Homage to my teacher the bearer of reality"
To His Holiness The 17th Galwang Karmapa Ogyen Trinley Dorje. His Eminence The 12th Tai Situpa, whom is an inspiration and guide in Tibetan calligraphic art. 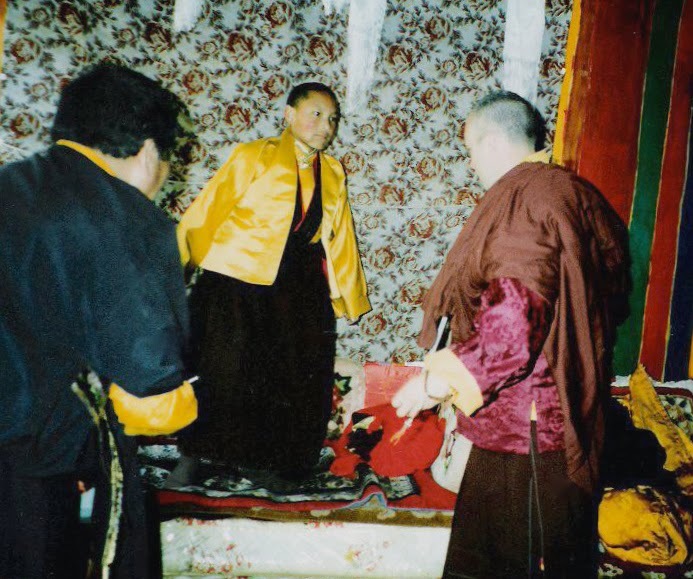 My spiritual father and scriptural moderator, the late Akong Tulku Rinpoche, along with his brother Lama Yeshe Losal Rinpoche, Abbot and retreat master. To my beloved teacher in the Tibetan arts, Master of Thanka painting, the late Sherab Palden Beru. Also my teacher in Lanza and Wartu Sanskrit scripts, Lama Pema Lodrup of Dharamsala. 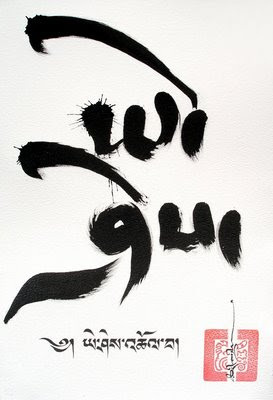 To Chogyam Trungpa Rinpoche, who opend my eyes to contemporary Tibetan calligraphy. To the late Tenga Tulku, for his precise instruction in the art of creating Mandalas. Not forgetting some of my other teachers such as, Thrungu Rinpoche, Lama lodro of Palpung and the late Lama Thubten of Palpung and Nyingma Lama Pema. Tashi Mannox happily sandwiched between Sherab Palden Beru and Akong Tulku Rinpoche, London Samye Dzong 2008. 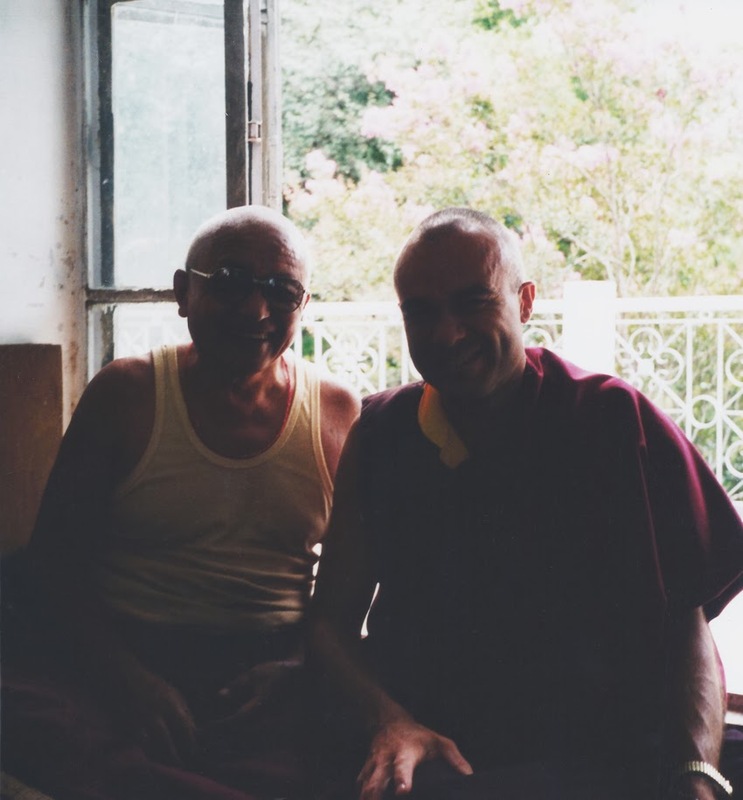 Tashi with Lama Pema Lodrup in 2000, at his home with beautiful garden, at the Men-Tsee-Khang, Khara Danda road, Dharamsala, India. 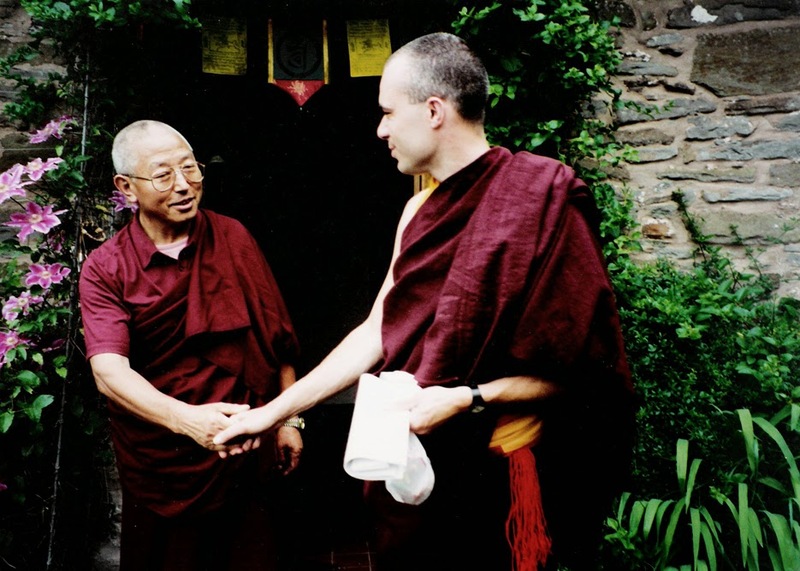 Palpung Lama Lodro and Tashi at Karma Naro in the Welsh borders 1987. 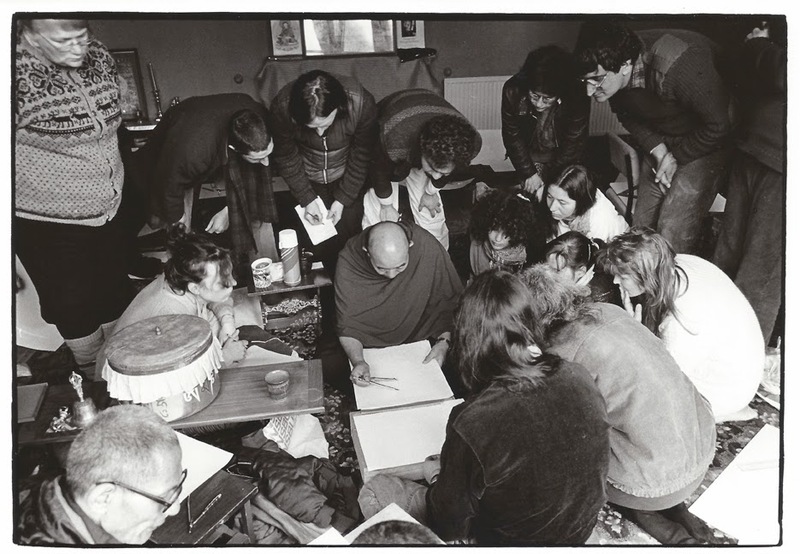 Tenga Rinpoche leading a course on 'Vajrayana ritual/mandalas' in the old shrine room of Samye Ling Johnstone house 1986. "Crazy wisdom is natural, effortless, not driven by the hope and fear machine of the ego." 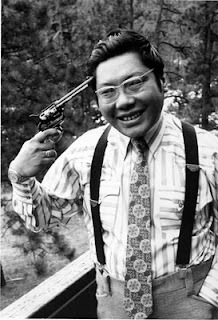 The late Chogyam Trungpa Rinpoche pictured here at play with irony. It can be said it was he who introduced the concept of crazy wisdom to the the West, America being his favorite play ground. 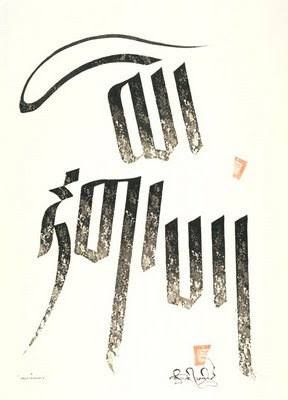 'Wisdom' in Tibetan Umeh script, the smaller text reads 'crazy wisdom' calligraphy Tashi Mannox 2009. "He subdues whoever needs to be subdued and destroys whoever needs to be destroyed." The idea here is that whatever your neurosis demands, when you relate with a crazy-wisdom person you get hit back with that. Crazy wisdom presents you with a mirror reflection. That is why Padmasambhava's crazy wisdom is universal. Crazy wisdom knows no limitation and no logic regarding the form it takes." Chogyam Trungpa Rinpoche pictured here as a monk in Bhutan during the early 1960's. Tashi recalls "I always remember one of my early teachers, Lama Thubten of Palpung, He would say, "A Bodhisattva such as Trungpa Rinpoche has the realization and confidence to leap like a lion over mountains, His followers unequaled, try to jump like little lambs, yet stumble and fall to break their legs. As a Dharma practitioner there is the justification and danger to use 'crazy wisdom' as an excuse to act irresponsibly, this would be better called 'crazy stupidity'!" One of Trugpa's sons, Gesar Mukpo wrote a moving poem of the anniversary of the death of his father. 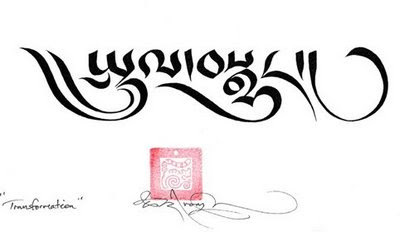 The word 'impermanence' mi rtag pa in the Tibetan Drutsa script style. The fragile nature of flowers and paper. Photographs and calligraphy Tashi Mannox, 4th May 2009. 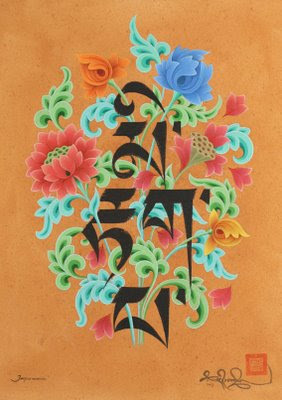 Tibetan Uchen script of the word Impermanence. Five buds to bloom, to delicate decay: Pride, jealousy, attachment, stupidity and anger, a turmoil cocktail, an emotional entanglement, even the most beautiful fall. The word 'transformation' in the Drutsa script. 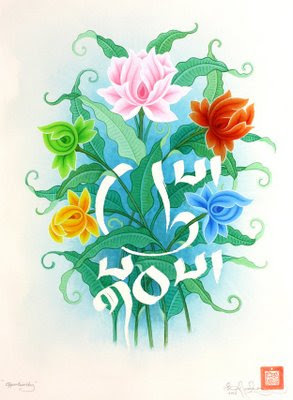 The Tibetan Drutsa calligraphy in this piece translates as ‘to seize the moment.’ These words depicted entangled with the stems and leaves of five different coloured lotus flowers. Each of these flowers represents the five wisdoms of the five Buddha families. Even the leaves themselves are hooked to grab as opportunists. Nothing ever stays the same! The words ‘mi rtag pa’ meaning 'impermanence' in the toppling Tibetan Tsugring script, are made up of small dancing skeletons, this figures fade into decay at the base of the letters. The personal seal of the artist is also broken into two. 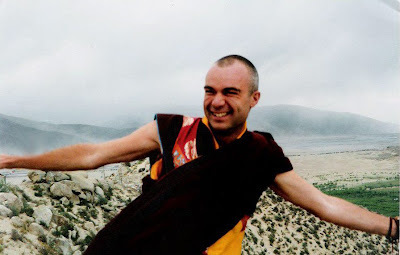 Tsering Tashi (Mannox) above Samye, Tibet, escaping a sand-storm in the great valley below. 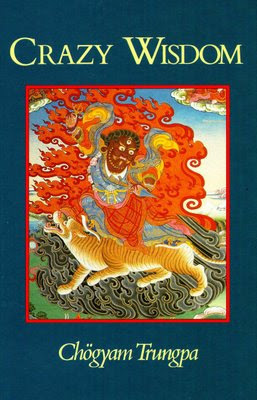 What the Six Pāramitās means to a Tibetan Buddhist monk. Each of the perfections is represented by the traditionally organised patches of various different brocades. These are shown as five sections (repeated twice), easily seen here on the right hand side of the Tonga, the sixth being the larger square on the back. Other meanings of the garment are the many pleats on the underarm, which represents the 84 thousand Dharmas. The blue coloured piping to edging the arm holes is in respect to the blue robes of a Chinese Buddhist order, when one of the Fully precepted Monks was drafted in from China to make up a required number of 10 to continue the ordination tradition. This was during the time of the Anti-Buddhist King Lang Darma of Tibet, who had killed all the fully ordained monks accept 9. Another reminder of the fragility of the tradition and of impermanence in general is the red lining of the collar, this represents the gums and jaw of the lord of death, a precarious place for ones head!. This antique Tonga from Tibet is typical colours and design of the Karma Kagyu order.